Hello, I’m new around here so please go easy on me. One thing I just love to do is make lists. Top 10 this, Top 20 that, lists are my thing. I think that one of my main tasks here at JMR will be list making. I’ll start my first post with something a little on the easy side. It’s my hope that my posts will generate a lot of interesting conversation by fellow readers. 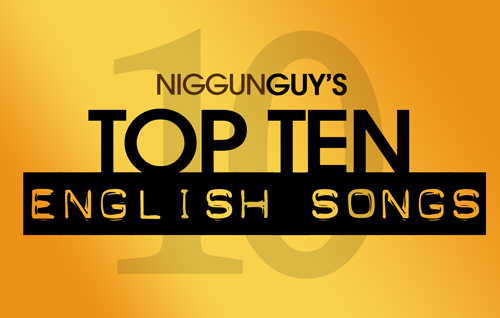 Without further or due, here are my Top 10 English Songs. This list is not a definitive list in all of Jewish Music, but Top Ten in what is considered mainstream Jewish Music. Neshamale: We can not talk about English songs without going straight to Abie Rotenberg. You could easily fill this list with his compositions but we will try to limit it to a few. Neshamale, what a powerful song, both in composition and in lyric. What could be more amazing then Mordechai Ben David and Abie Rotenberg? My Zayde: Moshe Yess has so many incredible songs, but none reached the masses like this one. Moshe Yess had a talent for capturing not just a song, but a message. One of warning and Jewish pride. We will miss you Moshe’le. Someday: MBD has quite a few strong English songs. Someday is something special, not just because the words are great but because of the power of MBD’s vocals in this song. When we think of the “King of Jewish Music” it’s a song like that that got him that title. Yerushalayim Is Not For Sale: Don’t you wish todays English songs could carry the weight and strong message a song like this carried? I don’t think today it would be allowed or even attempted. This is another “King of Jewish Music” level song. No Jew Will Be Left Behind: Avraham Fried has some pretty amazing English songs too. No Jew brings us that soft, simple arrangement, with Avremels warm and hopeful vocals. I can only imagine what it was like to hear this song when it was first released. To be a witness to the birth of Chassidic Jewish Music. When: I look forward to debate on this in the comment section. But I think Yerachmiel Begun has a few “Top Ten” worthy English songs. Of all of them though, “When” is a masterpiece. Aside from the simple fact that “It’s Min Hashamayim” is one of Miami’s most perfect albums, and It’s Min Hashamayim, the song, is not too shabby either. When, is just that much better. The emotion the choir and soloists bring in this tune is nothing short of magic. The song itself is almost like a Tefilah in the way we ask – again and again, When? When? Deaf Man in the Shteeble: This could be Country Yossi’s most classic song. The song itself is a great story and who among is doesn’t still tear up at the end. But wait, Lev Tahor does such an amazing job with this cover, I think it would be a crime to not mention their version. And again, even though its years later, the end of the story will get you, every.single.time. The Ninth Man: Moshe Yess and Abie Rotenberg might have been the most talented 1-2 punch in all of Jewish Music. The incredible things these two did together brought us some of the best English music and themes ever. (Don’t forget the Marvelous Midos Machine!) The Ninth Man just like so many of the songs before it has such a wonderful layout in terms of story, but unlike the previous ones, this song isn’t about pulling your heartstrings as much as it’s just a fun story with a great upbeat message. Paying attention in Yeshiva and bonding with your teacher is very important and you don’t even have to forget about the Yankees to do it! Memories: (From Journey’s 2/OHEL 5758) This song for me covers the holocaust better than no other other song. The message is straight to the point and the emotion is just so pure. The Journey’s version is great but nothing beats the live version at Ohel 5758 with a duet by two of Jewish Music’s greatest, Avraham Fried and MBD. There are so many more great English songs. I know a Shlock Rock song should go here, but I just didn’t know which one. There are some amazing Destiny songs as well like Colored Candles, Tomorrow, Freedom Flight and of course Aleph Beis. I also must mention Journey’s It’s Time to Say Good Shabbos, as well as Yaakov Shwekey and Abie Rotenberg’s blockbuster Mama Rochel. This might also surprise some people, but the last honorable mention will go to Yeedle Werdyger for “Together” which has a certain something special, and when sung by Yeedle adds a whole new dimension. Ok – enough of what I think. What do you think? Agree? Disagree? What would you add to this list? Nice post and welcome! Together is actually an Abie Rottenberg song originally on The Marvelous Middos Machine. These are all great songs but I have to say I think Baruch Levine’s latest album deserves at least a mention… there are some really great stories, and it goes without saying that it’s all composed beautifully. Also, I would add, The Man From Vilna by Journeys which is beautiful in every way. I drive around listening to Deaf Man in the Shteeble and cry just about every time. How can you not? I love reading lists so I’m glad you like making them! lastly A.K.A Pela – WOW. I think that Shema by Yaakov Shwekey should definetly be in this list. It’s a very powerful, impactful, sad song with very well put together lyrics and the song overall jsut has a great feel with the kid’s voice joining in later on in the song. Deaf Man In the Shteeble! Memories!! No Jew Will be Left Behind!! Great list!!! memories from abie rotenberg and dont hide from me from avraham fried are my 2 favorate there are many more but these 2 stand out!! The original “The Little Bird” is an Israeli song called “B’arvot Hanegev”. The lyrics of the English song make no sense, though – an EAGLE is going SAVE the bird from the VULTURES?! Eagles are predators, and vultures are scavengers! Sheesh. So I give it no credence as an English song. Your other picks are pretty good; though Aibeshter (from Tzlil V’zemer) should be up there instead of the squeaky When. The Little Bird in English was written at Camp Gan israel montreal in the 80s. It first appeared on a record the camp released back then. This song was written in 1947 by Malka Steinberg Saks at Camp Bais Yaakov. It was right after the end of World War 2 and one year before the establishment of the State of Israel. these are all really great but does anyone know of any that are more up beat?